The main difference between this lacquer range and the competition is the durability. LOBADUR® 2K Fusion is especially designed for floors with a very high load usage as it has an extremely high resistant final finish. 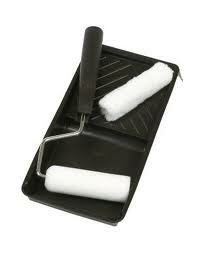 • Primer with a film coating It is a good filling primer that forms a film coat. 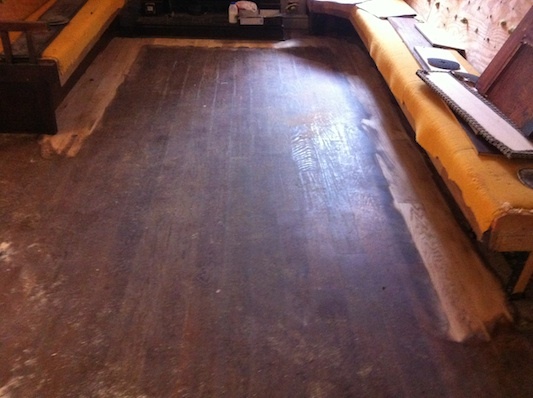 It also enables excellent results on absorbent wooden floors. • 100% free of roller marks. 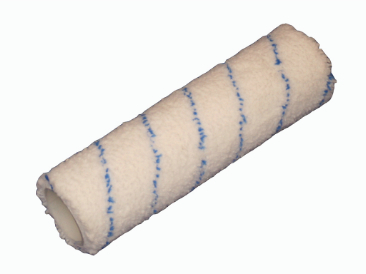 The visibility of roller marks is reduced due to high flow properties and the long open time. The above text is the standard Lecol/Lobadur product information for this lacquer system, which we used recently for the first time on a two roomed project for one of our regular corporate clients - the results were just superb. As a professional, when you use a new lacquer that you have never used before, it always leaves you with slight doubts, even though I had heard very positive reports from a colleague in the floor sanding industry, there is nothing like putting the lacquer down yourself to ease those lingering thoughts of impending doom and gloom. The time had arrived to start applying the Lobadur WS 2K Fusion - The Oak strip flooring had been properly prepared, vacuumed and tack clothed, the primer had been applied and the moment of truth was upon us. We mixed the hardener into the main product [shaking it first], gave the main can a good shake, left it to settle for a few minutes then we were good to go. I have to say this product was an absolute joy to apply, it flowed beautifully even when using a small 4" foam roller to cut in, the product left precious few white lines in the lacquer which were easily removed with only a tiny bit of re-working, using the 15" roller we were using for this project to apply the lacquer was even easier than the cutting in, as I mentioned before, the flow of this product really is excellent, it was easy and quick to work the product with the roller, both the areas we had to apply the coats of lacquer onto were done in no time. The product drying time in between coats was pretty impressive also, each coat took less that 2 hours to naturally air dry, this is quick when you take into consideration that this is a high traffic 2 component product which can take between 3-4 hrs per coat to dry. 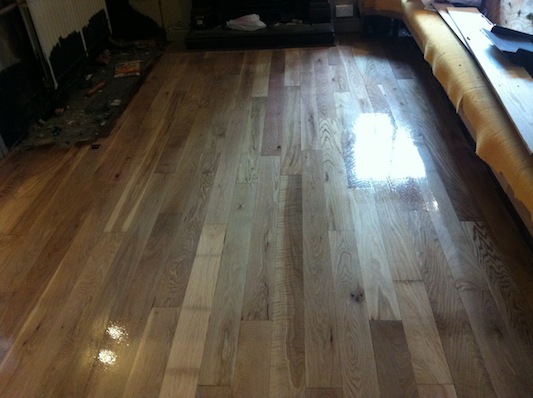 In summary, if any one out there is looking for a high quality 2 part lacquer product for their wood floor refinishing project then I would suggest you've found what you are looking for. Lobadur WS 2K Fusion is right up there with Bona Traffic HD and Junckers HP Sport in my opinion, it ticked all the right boxes and then some, was easy to apply, and price wise is a quite a lot cheaper than Bona Traffic and about also a fair bit cheaper than Junckers HP Sport here in the UK and is eqaully as good in terms of application, looks and ease of application. The 2 pictures below are direct before and after pictures from one of our recently completed projects where we used the Lobadur WS 2K Fusion, judge for yourselves how it looks - pretty darn good in my humble opinion. Thanks for reading, call back soon for more product reviews. For this project we applied the Lobadur WS 2K Fusion with a 15" Medium pile Roller, and cut in with a 4" foam roller. *NB* Woodfloor-Renovations would like to thank Mr. Duncan Conlan , [Wakol/Lecol UK Sales Manager] for his help and valued technical expertise on this project...Many Thanks Duncan. Are you looking for a place to buy the excellent Lobadur 2K Fusion or other quality Loba products ?? Look no further, click on Grandparkett.com who sell the full range of Lobadur and Wakol products. Lobadur WS 2K Fusion can be applied to a wood floor in a number of ways, a floor sanding professional will use a variety of application methods depending on the size of project, but if you are looking to apply lacquer to for example a 20m2 lounge, Oak strip, a 9" roller would be perfectly acceptable, the roller refill you need should be a 'medium pile' with the pile length being approx 8mm, a decent quality roller will have that information on the packet, use an inch and three quarter roller and cage, these are more robust and just better than the cheaper inch and a half alternatives.